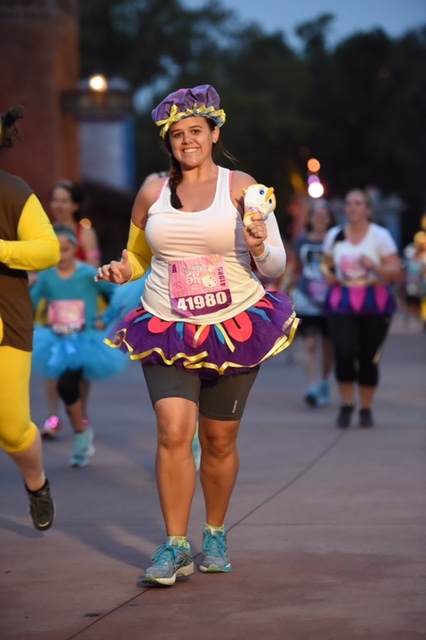 From the second I signed up for the runDisney Princess 5K and knew Mrs. Potts was the basically the star of the race I decided I must dress like her! I really wanted to take the easy way out on this one and buy a costume, but surprisingly there are really no (affordable) costumes out there. So it was time to head to the drawing board. First I decided I was going to recreate her lid to serve as my hat. The next part of her that I decided to recreate was the base of her teapot, which I would do in the form of a tutu (her base fans out like a tutu anyway, so this design feature just made sense). Then I was really stumped on how I was going to create her body. I knew a white tank top was a must, but where to go from there… how do I incorporate her handle and spout? Do I create her face? So I had to get the base of what I was going to wear as my costume first before I could turn it into any sort of creation. Time to head to Amazon.com (my favorite site for finding the cheapest gear to turn into costumes). I decided to go with a white tech running tank and I would re-wear a pair compression shorts I already had (because let’s be honest whatever I wear on the bottom under the tutu is basically the table she is sitting on). Then I ordered a purple tutu to make her base. 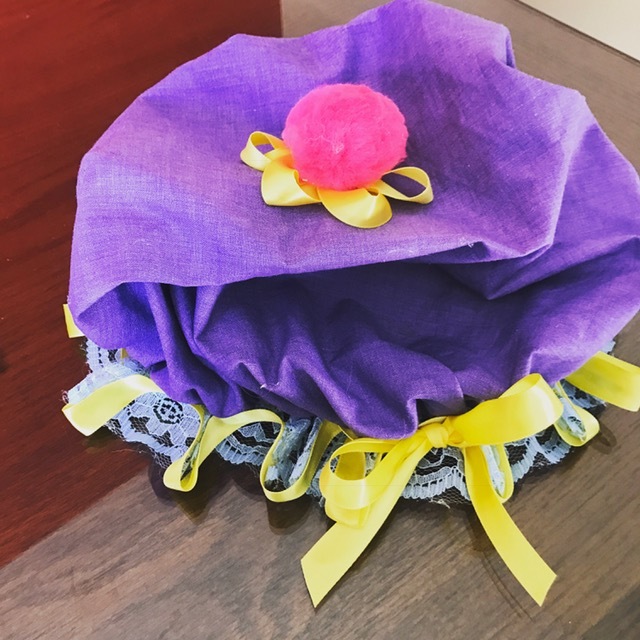 The next step was tricky: I searched all over for a purple bonnet but could not seem to find any, even when I broadened the websites I was searching. In the end I went with a white one deciding that I would dye it purple. So, let’s start with the bonnet. I bought purple fabric dye from WalMart and began reading the directions on the back of how to use this dye. Wow, I didn’t realize the amount of time that went into dying something. I filled up my kitchen sink with a gallon of hot water (I put the water on the stove first to make sure it was plenty hot enough since the instructions did not give a set temperature). Then I added a ¼ cup of salt to the water along with the dye mixture and stirred until dissolved. Next I submerged the bonnet into the water and began stirring for 15 minutes. After 15 minutes the bonnet had to stay in the dye for another 45 minutes, stirring occasionally (I stirred every 9 minutes). I then rinsed the bonnet out in cold water and let it air dry. 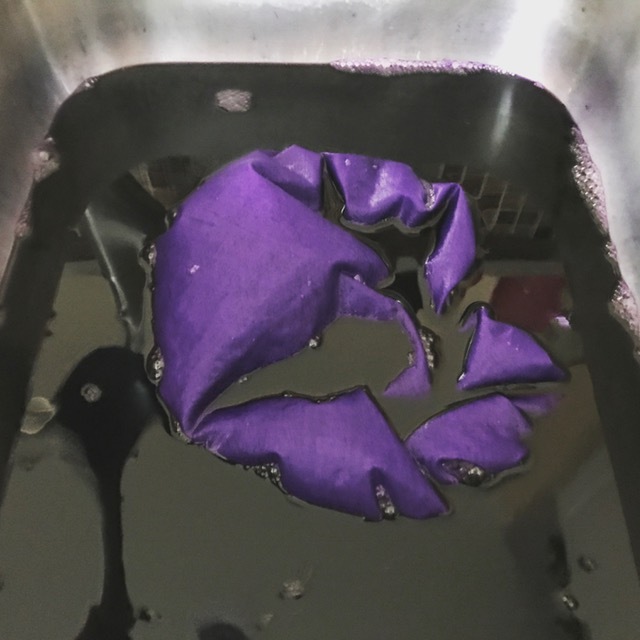 The next morning I washed the bonnet in the washing machine just to ensure that when I’m running the dye has set in and does start turning my head purple. While I was occasionally stirring the bonnet I set to work on turning the purple tutu into the base. I cut out at a handful of pink half ovals and a handful of blue long strips with a point at the end. I wasn’t exactly sure how many I would need so I cut as much felt as I had. Next I hot glued these pieces around the top of the tutu alternating colors. The next step was to outline the bottom of the tutu in yellow ribbon followed by the top using hot glue. After doing that I added a little yellow bow to the side for some femininity. Finally I added black pipe cleaners to the pink felt with hot glue. 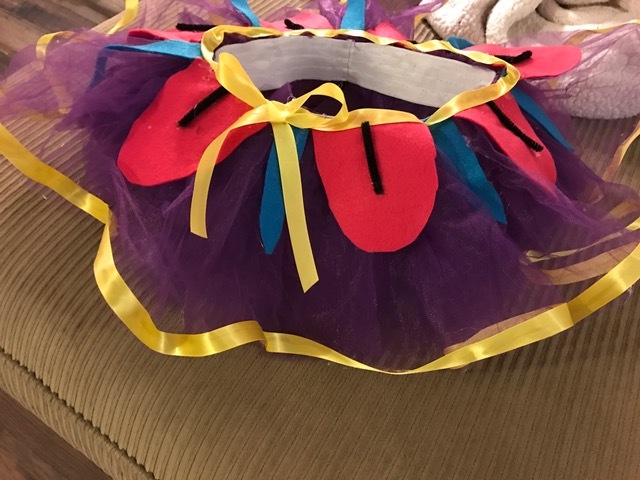 Once I had completed my tutu I showed it to Mike, he praised how great it looked but had one question for me: did I measure the top ribbon to my waist? Crap… no I had not. Do you all see what the problem was with that? Well, the tutu is an elastic waistband so it stretches to fit your body. However, by placing a yellow ribbon around the top, it was no longer able to stretch. Unfortunately I had to try to undo the ribbon (which unfortunately did rip some of the tulle on my tutu). As I pulled some of the ribbon up I was able to stretch the tutu out again. 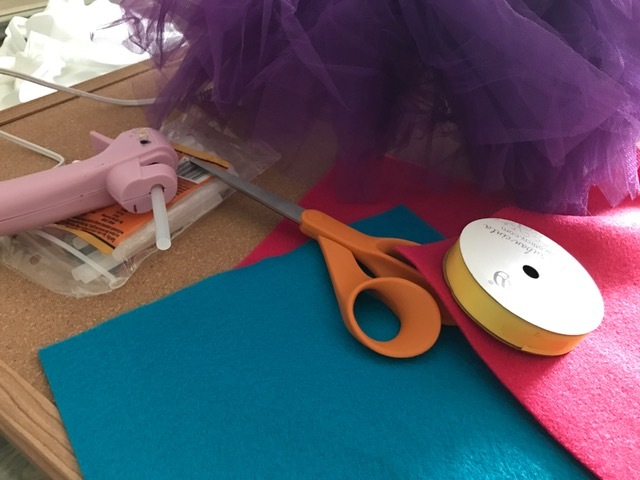 In doing this I realized I needed to add about 3 more pink and 3 more blue pieces to the tutu because when it was stretched out there were quite a few noticeable gaps which were luckily in the back with the way I had pulled the tutu. I also had to add more ribbon in these areas, but this time I just added segments of ribbon strips so that it would stretch. Lesson learned…next time I do this I will glue stuff onto the tutu while I’m wearing it. Fortunately it was salvageable and since there is so much tulle it’s hard to see where I ripped it unless your up close and personal with it. After the fiasco of trying to fix the tutu I took some time off of working on the costume because I became overwhelmed. Once I got back to working it on I really had to think about how I was going to create her body. I created her face out of felt and quickly realized the placement of her eyes would be in a very awkward place on the running tank, so I quickly decided not to do that. I decided that my bib is going to take up the majority of the tank top anyway and that it was not important to have her face. I still wanted to incorporate her handle and spout. I eventually decided that for the handle I would wear a yellow running sleeve on one arm and for the spout I would wear a white running sleeve on the other arm. Now just to remember to pose correctly for photos! It was finally time to come back to the bonnet. I decided to wrap yellow ribbon in and out along the lace of the bonnet and attached using hot glue. Next I took a pink fluff ball and added loops of yellow ribbon underneath it and attached to the top of the bonnet. Voila, my race costume was complete. For the finishing touch to my costume I decided to get a stuffed Chip to run with. 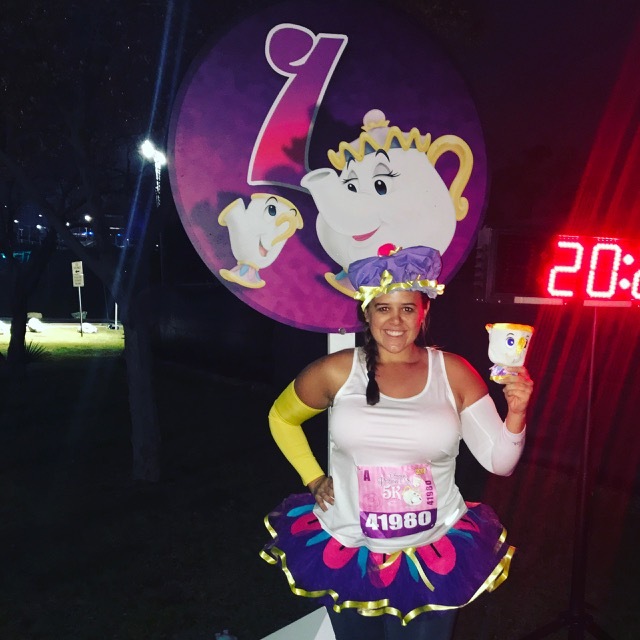 What’s Mrs. Potts without her Chip? Also they are both on the medal. 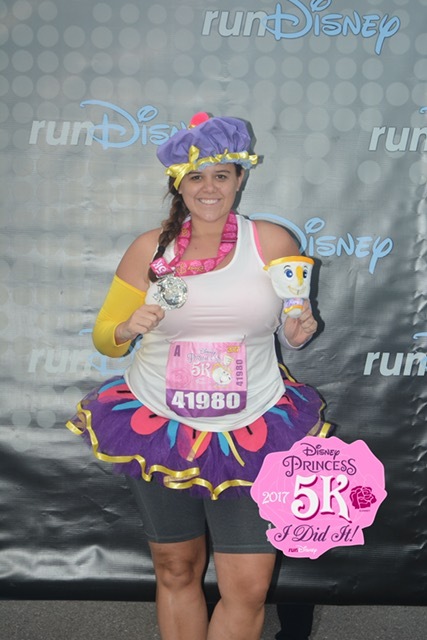 The day was finally here, time for the Princess 5K! I laid out my costume the night before just so I knew where everything was so there was no rush in the morning. 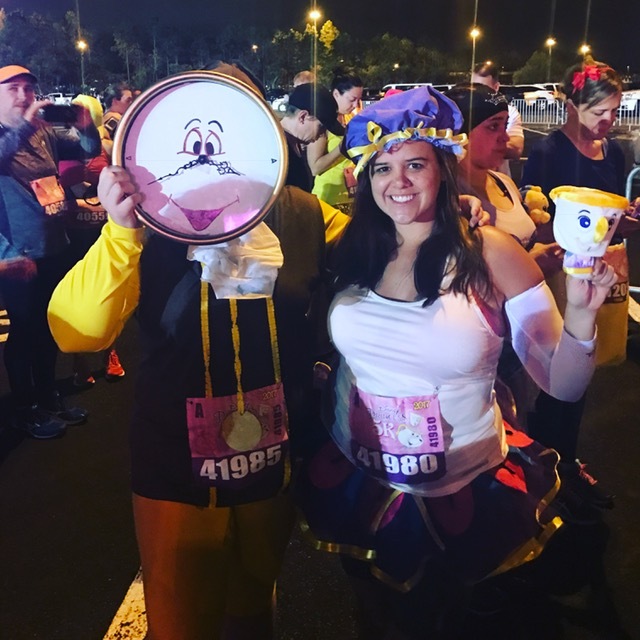 runDisney already has you getting to the race early, but I wanted to get there even earlier for photo ops. I got dressed quickly and was ready to go, no extra time necessary to get ready in this costume.